Say hello to healthier, brighter looking nails with the Nailkale Superfood Base Coat from nails inc. Containing aloe vera, ginseng, pomegranate and lemon amongst other natural ingredients to nourish and smooth the nails, this unique formula gives a long lasting gloss finish and is perfect for wearing alone or as a base coat underneath your favourite colour. Also enriched with vitamins A, C, E, F and H to provide extra protection against splitting and breakage, this lavish base coat uses keratin activation to stimulate nail growth to leave you with perfectly preened nails with minimal effort. K.D. Can be used as a treatment and base coat. 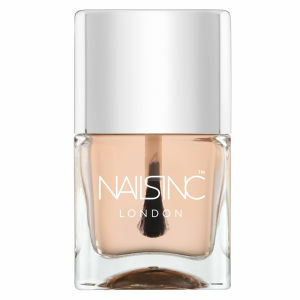 Apply 2 coats 3 times weekly as a treatment or use under your favourite Nailkale colour as a base coat. This stuff is just wonderful. It is exactly what it says on the bottle with the added bonus of a great brush making it glide onto your nails. Way, way, way worth the slight extra cost over ‘ordinary’ base coats. I love it, nothing else will do for me. This made my nails look shiny and healthy. I have only been using for a week, so too early to tell if the condition of my nails improve.